How good, indeed. 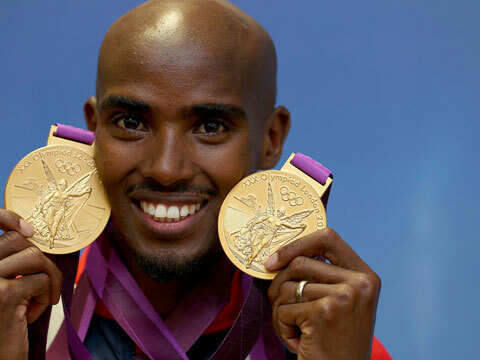 This victory elevated Farah to the distance-running pantheon, establishing him alongside Hannes Kolehmainen, Emil Zatopek, Vladimir Kuts, Lasse Viren and Kenenisa Bekele as one of only six men to have won the Olympic 5,000 and 10,000m double. The historical significance was too much for the man of the hour to absorb. Overwhelmed by the volume of the partisan clamour, which he described as a “Mexican wave of sound”, he headed to the stands to give a calming kiss to his wife Tania, who was expecting twins. Aptly, he dedicated this unforgettable moment to his unborn baby girls. While our abiding memories of the night are of the Farah celebrations, slapping his head in trademark ‘Mo-bot’ style before planting a kiss on the London track, it pays not to forget just how fiercely fought the race itself was. A highly tactical affair at the outset, as Farah’s Ethiopian, Kenyan and American rivals all jostled to unsettle him, its drama was only detonated in the final mile. Farah, exactly as he had in the 10,000m, assumed control, moving on to the shoulder of the leading pack and taking up the running with 700m to go. Confident in his finishing pace, which he had honed so meticulously under coach Alberto Salazar at his Oregon training base, he threw down the challenge for his adversaries to come past him and for the second time in a week they could not respond. Steve Cram, who called these last two laps home so memorably for the millions of television viewers, did not understate the difficulty of Farah’s task. “I enjoyed Mo’s 5,000 victory even more than I did his 10,000, and that was brilliant enough,” he said. “With the 10,000 it was almost like waiting for the inevitable to happen. The five was a much tougher ask. Farah himself had admitted to fatigue from his exertions over 10,000m, sparking concerns that he might not be able to produce his customary kick down the finishing stretch again. And yet in the course of 13 minutes and 41 seconds that combined patience, ruthlessness and unanswerable turn of speed, his iconic status was assured. The nation embraced him unconditionally for his single-mindedness and his slightly zany charm. A Somali by birth but a Londoner since he was eight years old, Farah also became a powerful emblem of the capital’s diversity. Indeed, as the figure known henceforth simply as ‘Mo’ soaked up the ovation of the stadium’s 80,000 souls, his eldest brother, Faisal, had walked four miles from his Somaliland homestead, just to reach the nearest village with electricity so he could watch the race on television. Extraordinarily, even in the afterglow of Farah’s exploits, the night was not finished. Usain Bolt, the only athlete who could rival him for star wattage after a second successive Olympic sprint double, was required to bookend the track and field programme with one last flourish and duly did so, leading his Jamaican quartet home in the 4x100m in a world record of 36.84 sec. On a day of heightened emotion all around, other stories of great pathos were unfolding. At the Aquatics Centre, Tom Daley, 14 months after losing father Rob to brain cancer, grasped a hugely creditable bronze medal in the 10m platform competition. The 18 year-old had long been the cherubic face of British diving but never had he exhibited courage such as this, sealing his medal with a concluding back three-and-a-half of virtual perfection. Back at the epicentre, in the Olympic Stadium, night had long since fallen and still the Farah fervour would not relent. “We want Mo!” the crowd cried as they waited for his gold medal presentation. Amid the din, TV presenter Ben Shephard astutely spotted the ultimate photo opportunity. Beckoning Farah and Bolt to mount the rostrum once more, he and the thousands privileged to be there watched as the pair struck a defining pose: the lanky sprinter attempting the Mo-bot, and the slender distance man at his side replying in kind with the famous ‘Lightning Bolt’ gesture. Two totems of the Olympic track. Bolt might have enraptured the masses with his records and effortless charisma, but another Saturday night special from Farah ensured this corner of East London would remain forever Mo-town. - Liam Heath, Jon Schofield Canoeing, men’s K2 200m.